Dr. Pinch & the Pinchtones performance, part of the Metro Presents series. 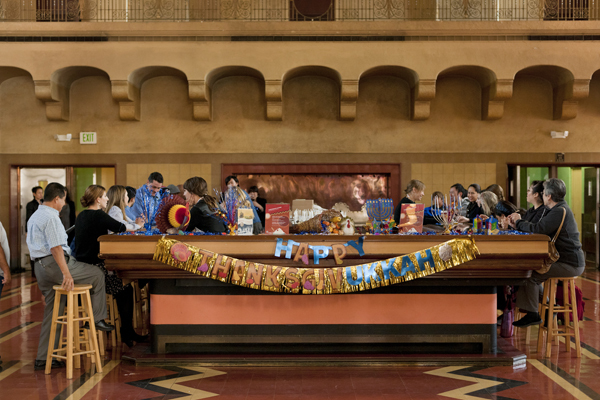 On the occasion of Union Station’s 75th anniversary, Metro created a special commemorative publication, Union Station: 75 Years in the Heart of LA, featuring eight written and five photographic essays that celebrate the station. This is the first in a series of eight posts with the full essays by authors John C. Arroyo, William D. Estrada, Stephen Fried, Rafer Guzman, David Kipen, Marisela Norte, D. J. Waldie, and Alissa Walker. The book is on sale now at the online Metro Store. All essays will also be posted on The Source in the coming weeks. The series was edited by Linda Theung, an editor and writer based in Los Angeles. It is just after the flurry of rush hour, the last of the commuters’ footsteps echoing in the low-slung tunnel toward the final Metrolink train of the day. The sun has slipped behind the towers of downtown, the blanched stucco archways slowly assuming their hazy golden glow from the wrought iron lanterns above. The heavy cinnamon sugar that hangs in the air begins to dissipate as Wetzel’s Pretzels switches off its heat lamps for the evening. A swiftly darkening departures board shows only buses this time of night. I’m sitting at Traxx Bar on this fall evening, drinking a glass of red wine, and taking in the parade of humanity. The men at the table next to me are loudly debating the merits of various downtown restaurants as they layer condiments on their burgers. Two young women scurry through the main hall, giggling and pointing dramatically at each other’s phones. A man trudges by wearing a red quilted vest, his backpack sagging with the heavy resignation of a long journey that’s nowhere near over. He pauses right in front of me. One of several performances of Invisible Cities. Courtesy of the author. My fellow Traxx patrons are well versed in the pageantry of reality shows—they look around nervously for a camera. Instead, we see a crowd walking quickly from the waiting area—faster than commuters, yet without a commuter’s single-minded determination. It’s the singing man they’re looking for, and when they locate him, they gather quickly around him, pressing their hands to their ears, which are covered in large audio electronics. We are not being punked. This is not some flash mob. This is a performance. During the four-week sold-out run of the Invisible Cities opera, hundreds of ticket holders donned wireless headphones to hear the live-action, live-singing opera played out in various corners of the station, accompanied by an orchestra tucked away in another room. Yet because the performance was unfurling in a public space, hundreds more passengers and passersby were able to experience the opera in some form as well. In fact, on this evening, I watched as three arriving passengers became comically integrated into a dance number as they tried their best to navigate their massive wheelie bags around it. Many times, it was downright impossible to discern the performers from the commuters, and half the fun became following someone around to see if they’d eventually break into song. As I looked around, hearing the hallways echoing with a cappella harmonies, I realized this evening signified a turning point for the station. The journey to get here has not been entirely smooth. In 2006 I remember seeing flyers for a Secret Machines (a New York-via-Dallas band) concert at Union Station. It was a guaranteed spectacle. There would be an exhibition of photography by the Cobra Snake, the photographer known for documenting the pursuits of the American Apparel–clad set. Shepard Fairey, before he designed President Obama’s 2008 campaign graphics and was just a well-known street artist, was booked to work as the DJ. And here was the brilliant catch: to get into the party, you had to have a Metro ticket. In the intervening decade, my job got easier as Metro’s Gold, Orange, and Expo Lines began to feather out like ribbons from a central node. L.A.’s transit map was slowly evolving from a primary-colored, shrugging stick figure into a colorful wheel of options that signified a real city. At the same time, L.A. went public. Festivals like GLOW brought a techno-throbbing, DayGlo-wearing Burning Man mentality to the beach in Santa Monica. Hollywood Forever began mounting movie screenings and ambitious concerts in a cemetery—in a cemetery, for goodness sake! And then there was CicLAvia, which changed everything. Here was not only a public festival that sliced through the center of the city, but one that sidelined cars. The first CicLAvia took place on 10/10/10—October 10, 2010. Seven miles of downtown streets were made car free for five glorious hours. Union Station wasn’t officially on the route, but it was the best place to see the change that Los Angeles had fostered. Not only were there transit riders from all over the region using the station to get to downtown, there were hundreds—maybe thousands?—of bikes streaming out of the concourse as the cyclists rode Metro, Metrolink, and even Amtrak to get to this historic event. 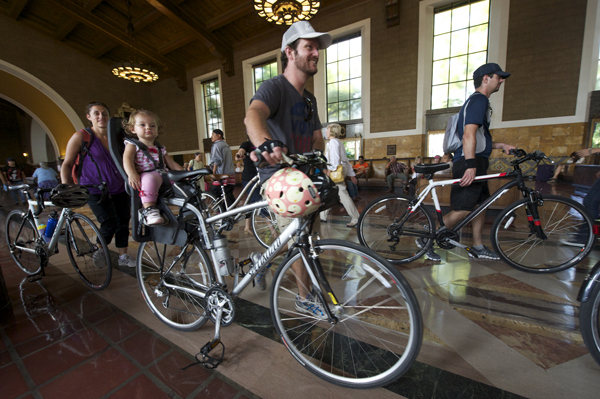 Cyclists passing through Union Station to CicLAvia, the car-free “open streets” event that began in 2010. The routes are designed to be Metro accessible and Union Station has been a busy connection point for cyclists and pedestrians on event days. Courtesy of CicLAvia. Photo by Gary Leonard. 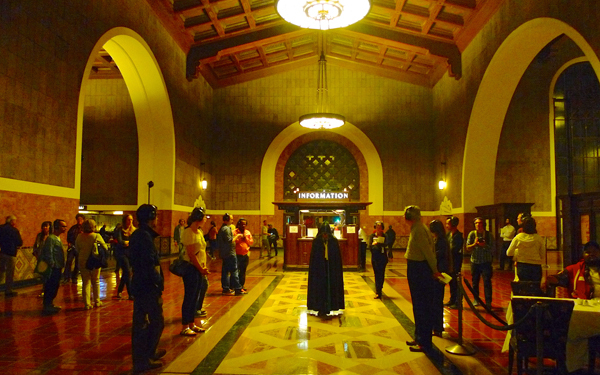 Today, Union Station has become a crucial part of many Los Angeles cultural outings. On warm weekends, I see teenagers, all knees and bare shoulders, swarming the Gold Line platform, headed to a festival in the Los Angeles State Historic Park. On summer afternoons, a sea of blue swells to the surface to board the Dodger Stadium Express, a fleet of Metro buses converted into free shuttles for baseball games. On winter evenings, it’s not unusual to see a couple in formal wear making connections to the Red Line en route to the Walt Disney Concert Hall. 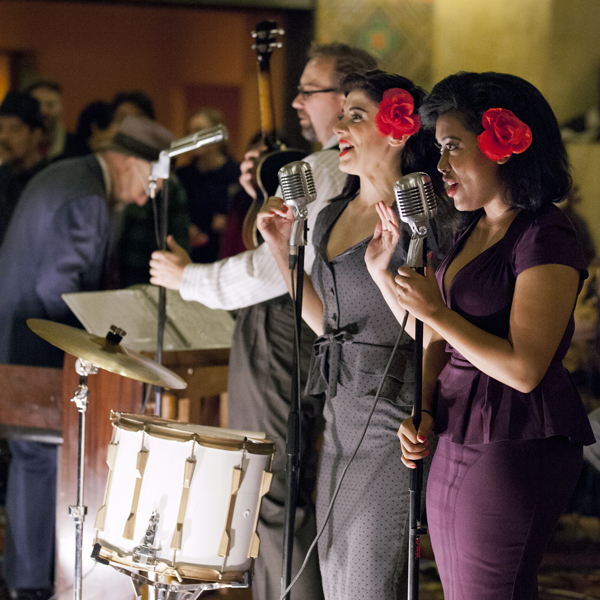 In fact, one of the biggest art events in L.A.’s recent memory rumbled right into Union Station late in September of 2013. A train made from nine vintage cars with names like “The Silver Quail” and “The Wisconsin Valley” rolled across the country, stopping at a dozen historic train stations along the way to host concerts and art installations and performances. Helmed by L.A. artist Doug Aitken, Station to Station was a roving music festival, a mobile production studio, a gallery on wheels, and one of the hottest tickets in every town it visited. The scale of Station to Station was immense. And people came from all over the city, all over the region, to see it. 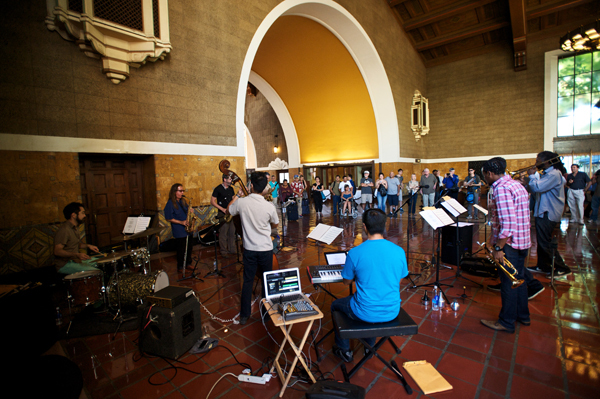 In a way, you could learn everything you needed to know about how L.A. had changed by comparing Station to Station to the Secret Machines concert in 2006. How? This time, you didn’t have to convince anyone to take the subway. 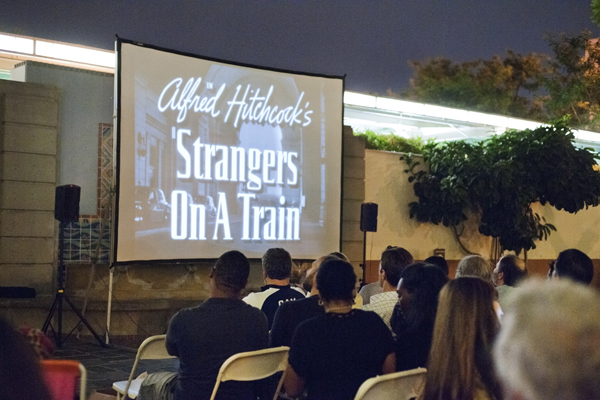 Metro now produces its own programming series, Metro Presents, which gathers young, transit-minded crowds for events like a communal Thanksgivvukah dessert event to a screening of Strangers on a Train. Thanksgivvukah dessert giveaway in November 2013, to celebrate the rare convergence of Thanksgiving and the first night of Hannukah. With hazy autumn light streaming in from the arched windows above, giving everything a slightly nostalgic, cinematic quality, I listened to Gil Peñalosa, a walkability expert from Colombia, describe the challenges facing pedestrians, cyclists, and transit riders who use the station. His talk was part of an event for the Union Station Linkages Study, which aims to improve the connections between Union Station and the cultural and historic sites in the surrounding neighborhoods. In short: It will enhance the experience of everything that happens once you leave the station itself. These connections are the missing links for the Union Station of today, and, in a way, the key to the future of L.A.
After proving it can provide a hub for contemporary commuting, now Union Station will toss its tentacles out into the city. Just imagine the possibilities for what we could see over the next seventy-five years: a freeway cap park over the 101 to guide tourists to City Hall; a viaduct that safely shuttles bike riders to Boyle Heights; one continuous cultural district stretching from Little Tokyo to Olvera Street to Chinatown and unfettered pedestrian access to the revitalized recreation opportunities of the Los Angeles River. In this sense, Union Station will likely be the first place in the city to show us a truly multimodal Los Angeles centered on a dense, walkable downtown where residents can choose from a wide range of viable transportation options. And soon, the iconic stucco facade of Union Station will take on another important meaning for our city. Not as a memory of a forgotten era, not as a relic of historic relevance, but as the symbol of the future—heralding the arrival of a new way of living in Los Angeles. Alissa Walker is the urbanism editor for Gizmodo and covers design, architecture, cities, transportation, and walking for publications like Dwell, Los Angeles magazine, The New York Times and KCRW’s public radio show DnA: Design and Architecture. You can find her work at awalkerinla.com. A live jazz performance by G.G. NineNet, in August 2013.